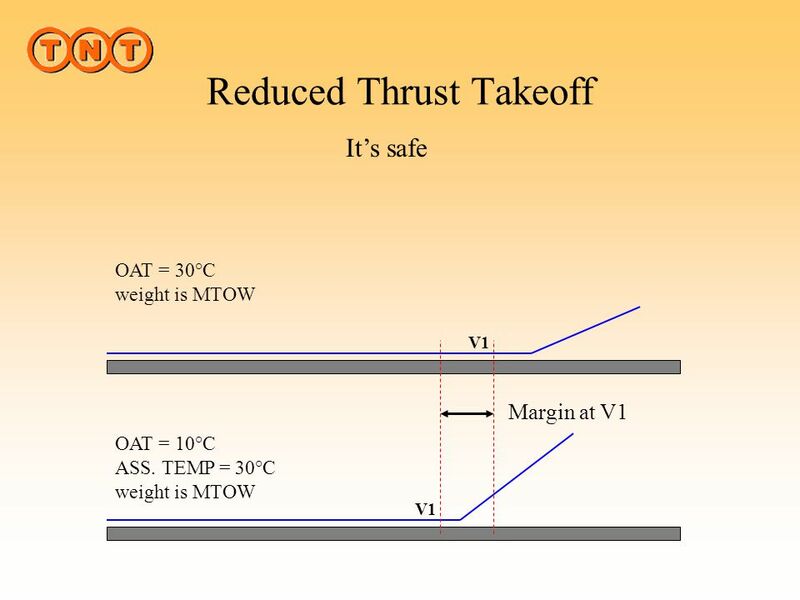 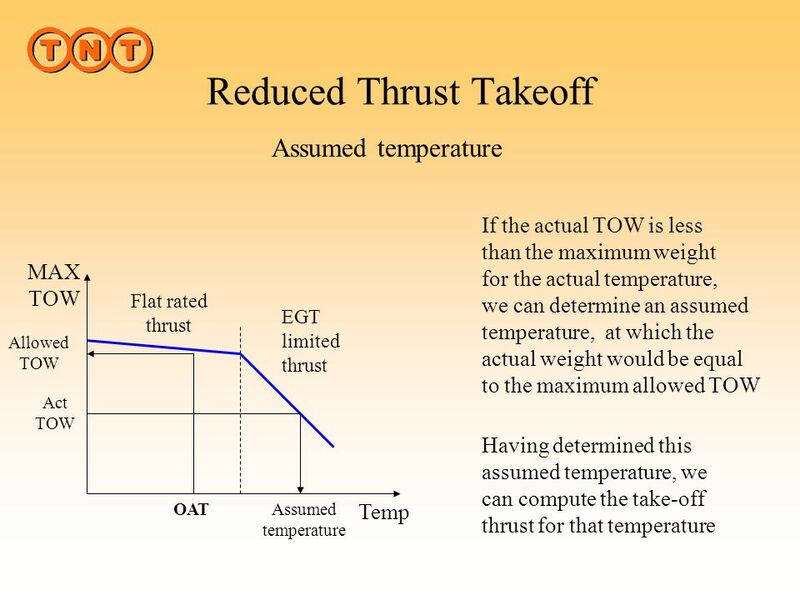 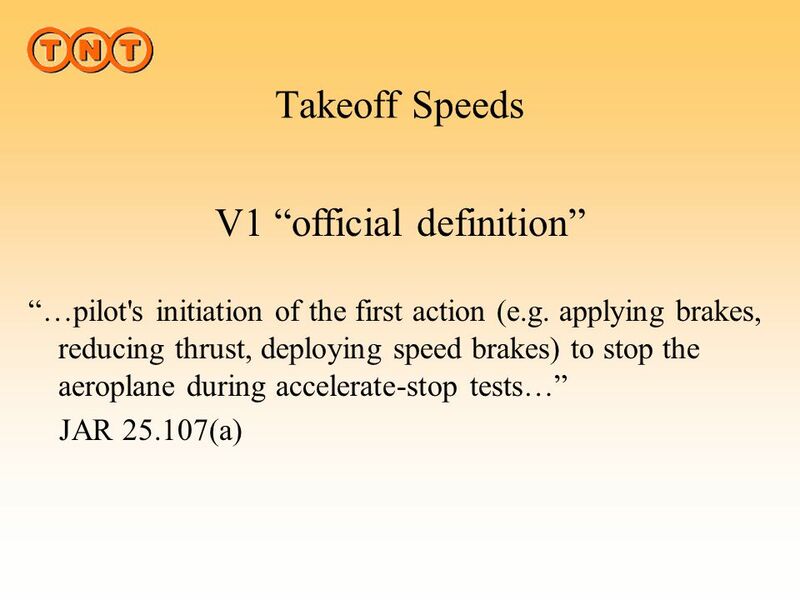 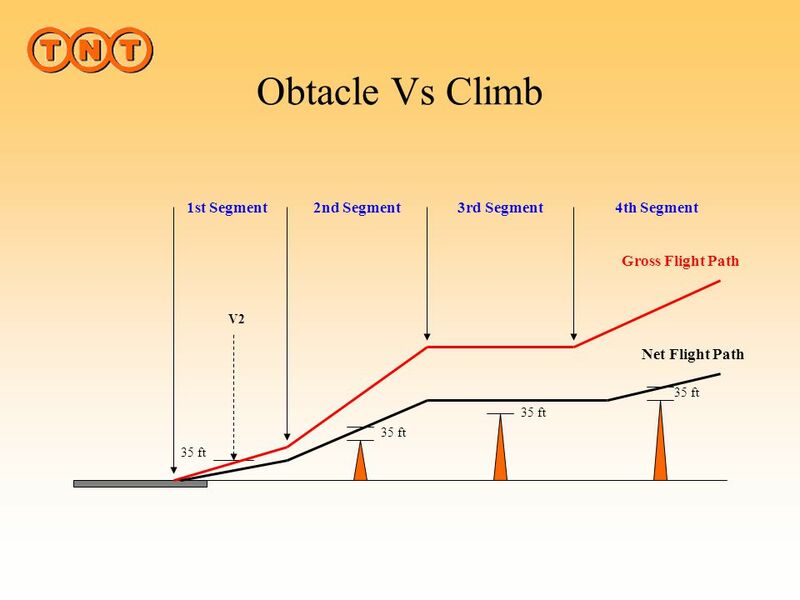 Takeoff Speeds V1 “official definition” “…pilot's initiation of the first action (e.g. 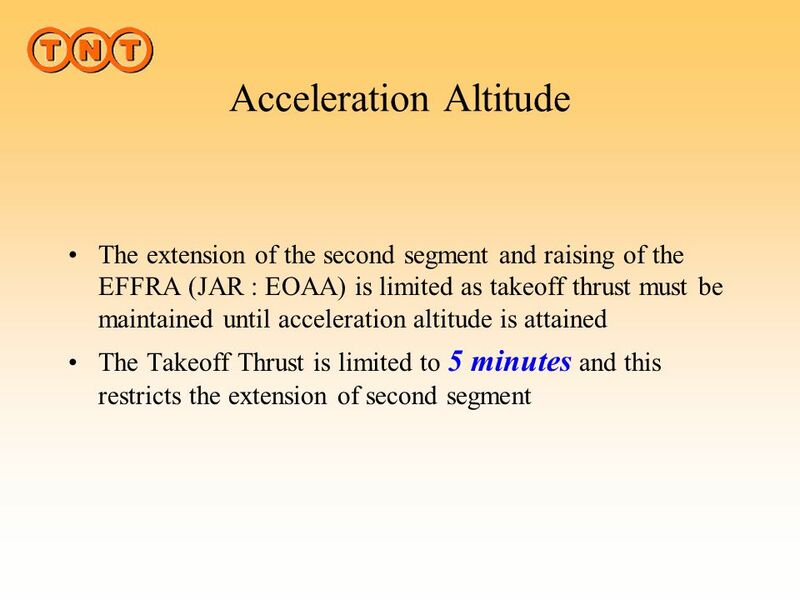 applying brakes, reducing thrust, deploying speed brakes) to stop the aeroplane during accelerate-stop tests…” JAR (a) JAR (a) V1 must be established in relation to VEF as follows: (1) VEF is the calibrated airspeed at which the critical engine is assumed to fail. 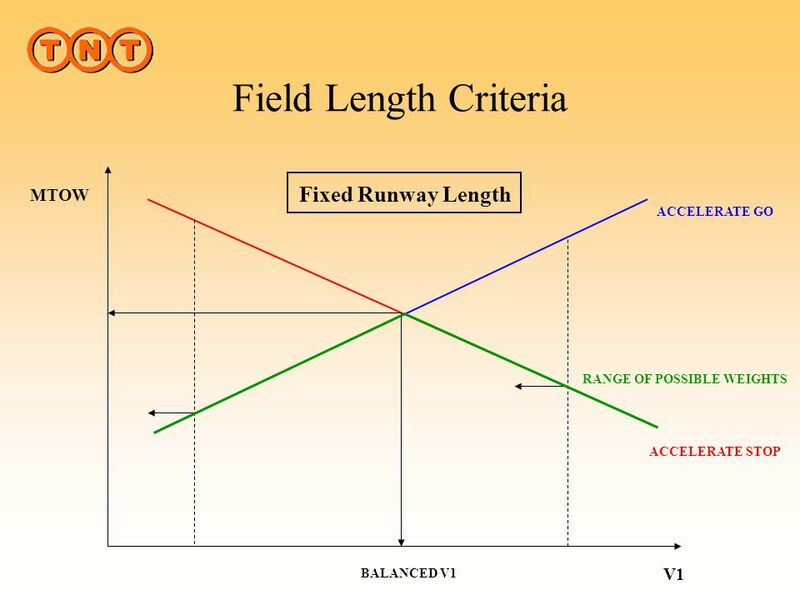 VEF must be selected by the applicant, but may not be less than VMCG determined under JAR (e). 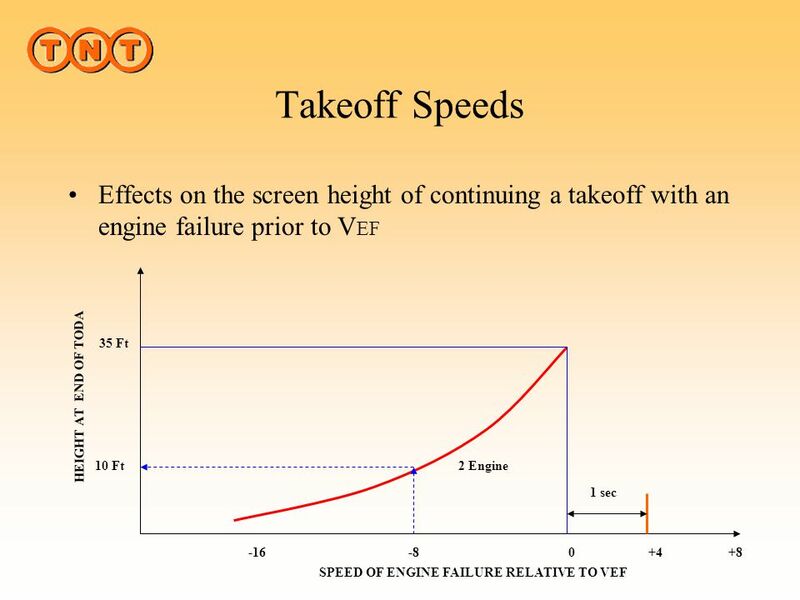 (2) V1, in terms of calibrated airspeed, is selected by the applicant; however, V1 may not be less than VEF plus the speed gained with the critical engine inoperative during the time interval between the instant at which the critical engine is failed, and the instant at which the pilot recognises and reacts to the engine failure, as indicated by the pilot's initiation of the first action (e.g. 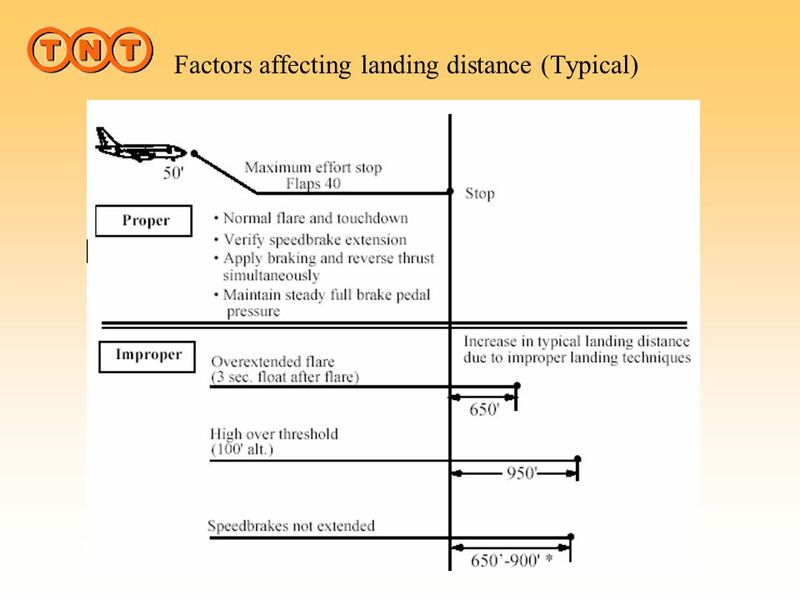 applying brakes, reducing thrust, deploying speed brakes) to stop the aeroplane during accelerate-stop tests. 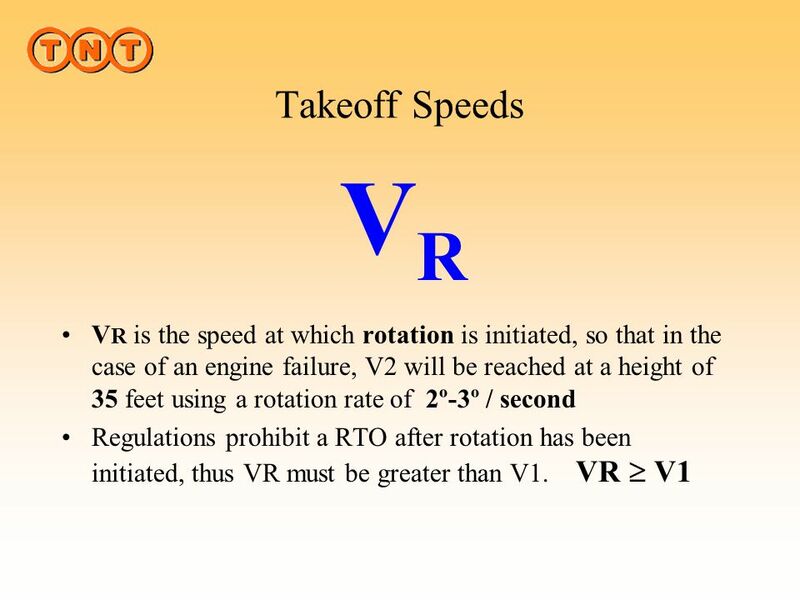 13 Takeoff Speeds V2 JAR (b) V2MIN, in terms of calibrated airspeed, may not be less than— 1·13 VSR for— (i) Two-engined and three-engined turbo-propeller powered aeroplanes; and (ii) Turbojet powered aeroplanes without provisions for obtaining a significant reduction in the one-engine-inoperative power-on stall speed; (2) 1·08 VSR for— (i) Turbo-propeller powered aeroplanes with more than three engines; and (ii) Turbojet powered aeroplanes with provisions for obtaining a significant reduction in the one-engine-inoperative power-on stall speed: and (3) 1·10 times VMC established under JAR (c) V2 in terms of calibrated airspeed, must be selected by the applicant to provide at least the gradient of climb required by JAR (b) but may not be less than-- (1) V2MIN; (2) VR plus the speed increment attained (in accordance with JAR (c)(2)) before reaching a height of 35 ft above the take-off surface; and (3) A speed that provides the manoeuvring capability specified in JAR (g). 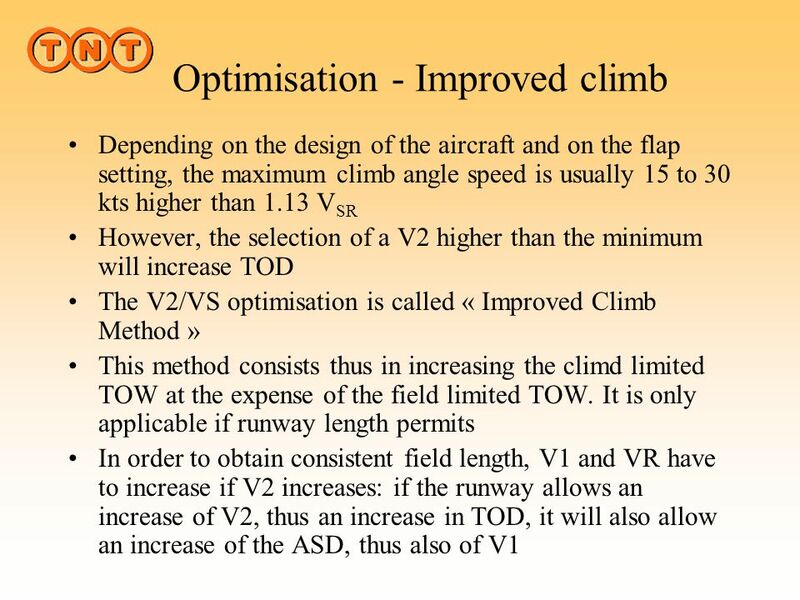 V2 is the takeoff safety speed. 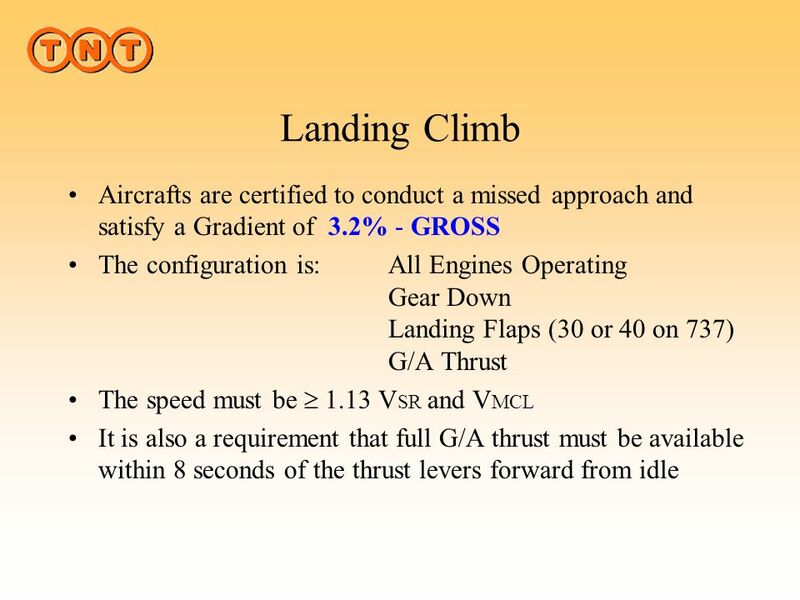 This speed will be reached at 35 feet with one engine inoperative. 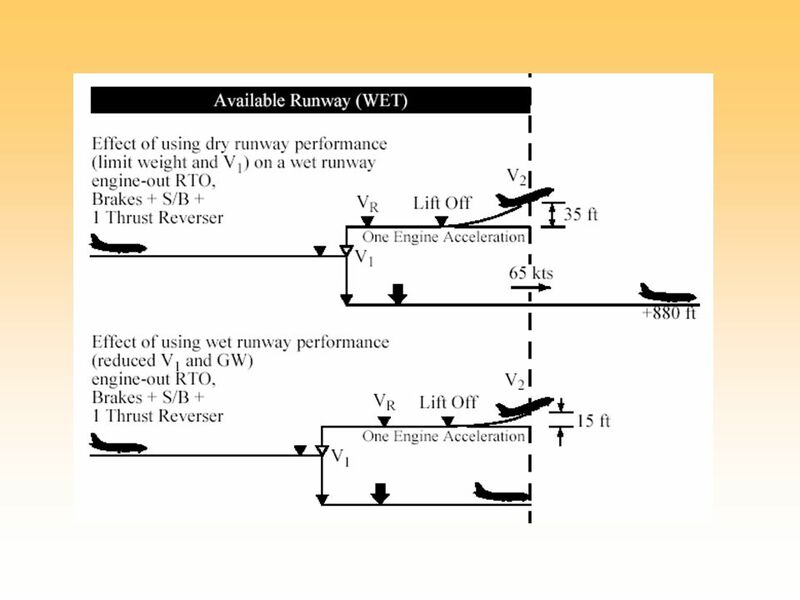 This is the speed, when airborne, from which it is possible to control the aeroplane by aerodynamic means only with the Critical Engine Inoperative while maintaining takeoff thrust on the other engine(s) The demonstration is made with not more than 5º Bank into the live engine, Gear retracted (as this reduces the directional stability) and the most Aft CG (as this reduces the Rudder Moment.) 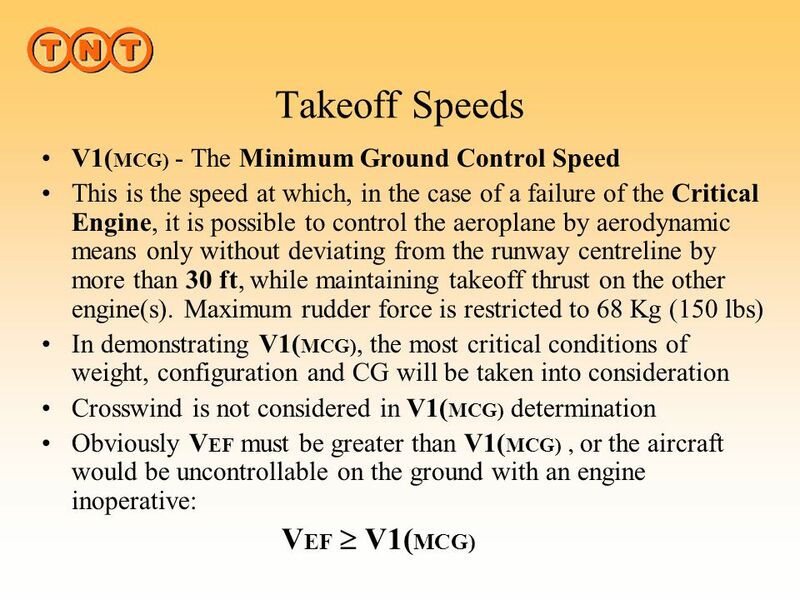 (VMC may increase as much as 6 Kts. 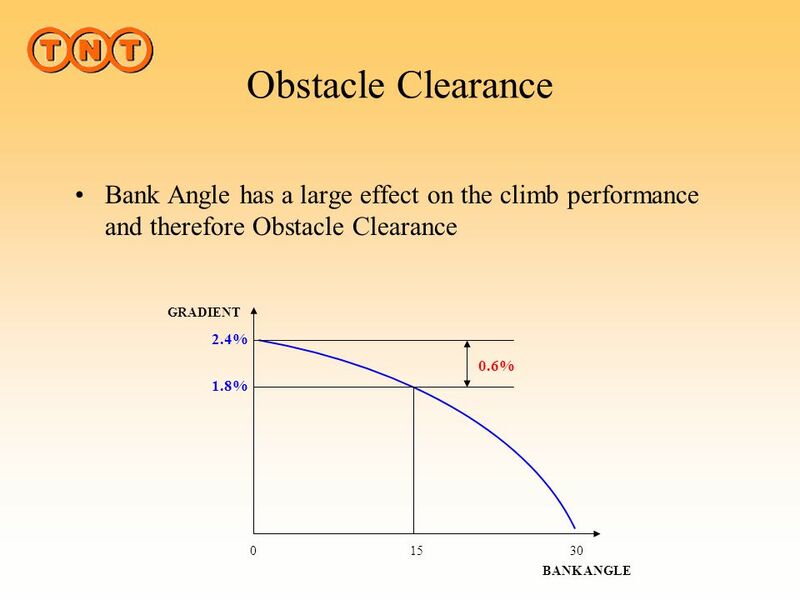 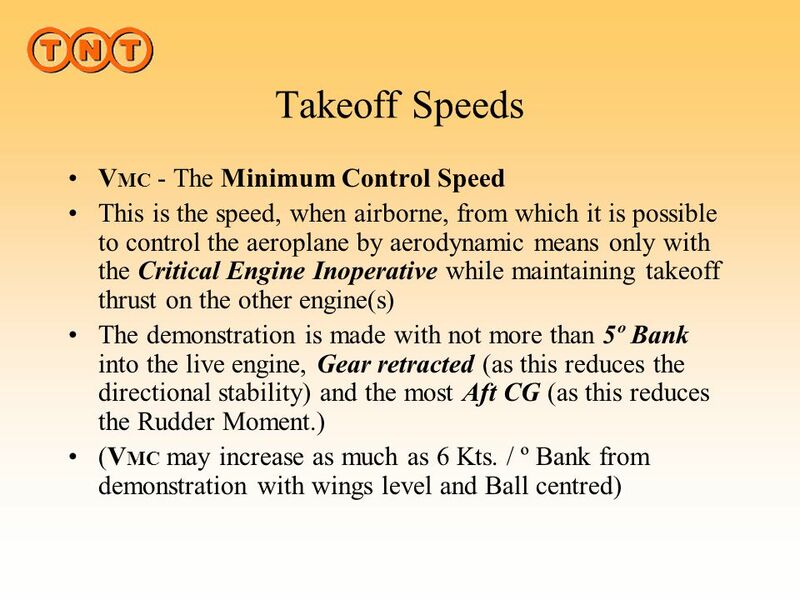 / º Bank from demonstration with wings level and Ball centred) JAR (b) VMC is the calibrated airspeed, at which, when the critical engine is suddenly made inoperative, it is possible to maintain control of the aeroplane with that engine still inoperative, and maintain straight flight with an angle of bank of not more than 5°. 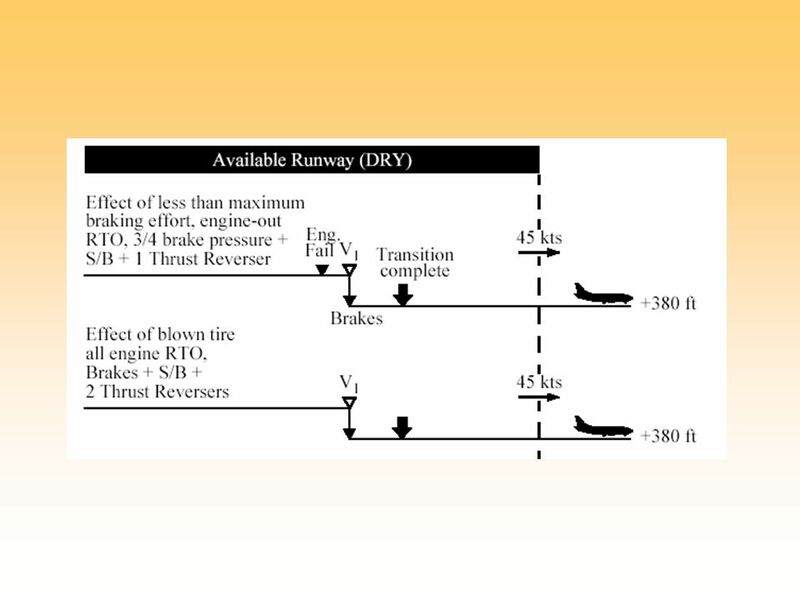 (c) VMC may not exceed 1·13 VSR with-- (1) Maximum available take-off power or thrust on the engines; (2) The most unfavourable centre of gravity; (3) The aeroplane trimmed for take-off; (4) The maximum sea-level take-off weight (or any lesser weight necessary to show VMC); (5) The aeroplane in the most critical take-off configuration existing along the flight path after the aeroplane becomes airborne, except with the landing gear retracted; (6) The aeroplane airborne and the ground effect negligible. 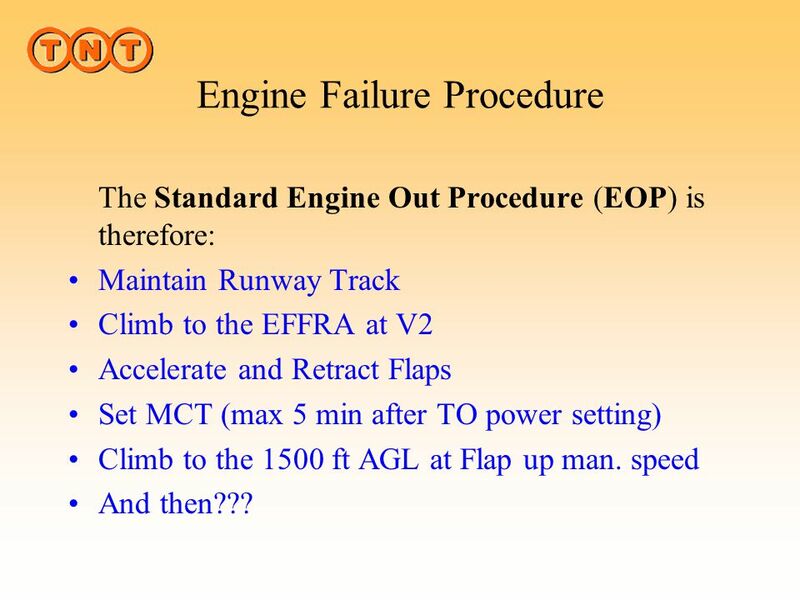 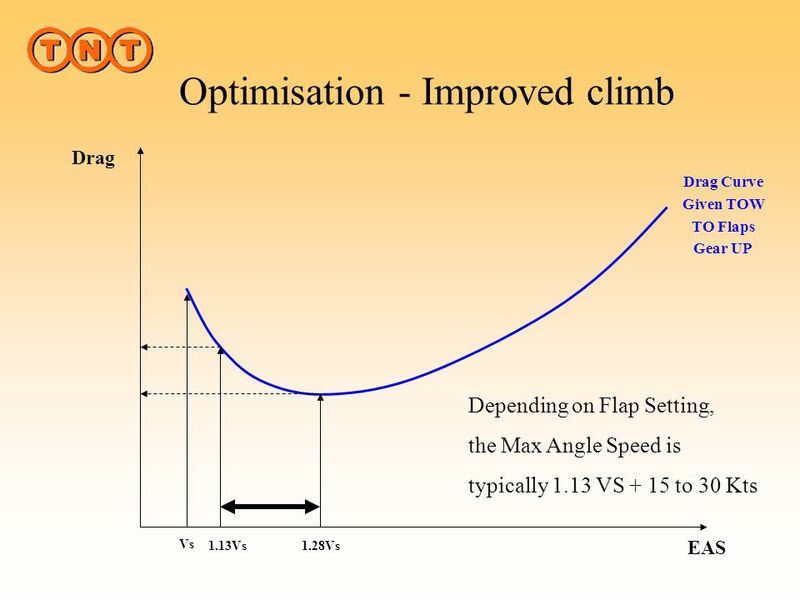 The Standard Engine Out Procedure (EOP) is therefore: Maintain Runway Track Climb to the EFFRA at V2 Accelerate and Retract Flaps Set MCT (max 5 min after TO power setting) Climb to the 1500 ft AGL at Flap up man. 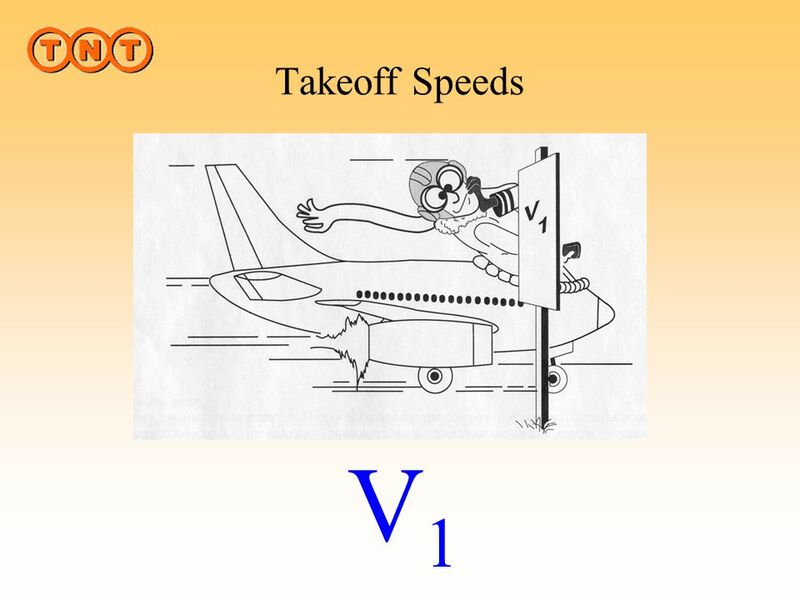 speed And then??? 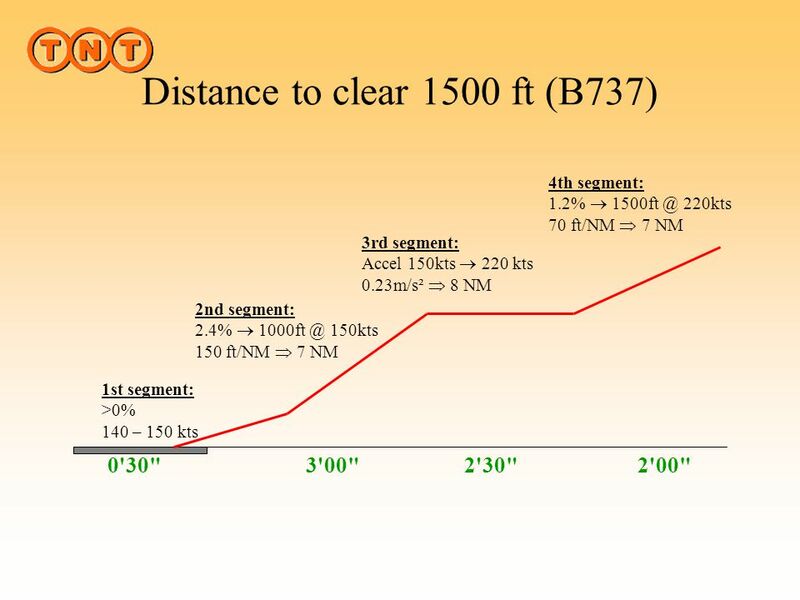 4th segment: 1.2%  220kts 70 ft/NM  7 NM 3rd segment: Accel 150kts  220 kts 0.23m/s²  8 NM 2nd segment: 2.4%  150kts 150 ft/NM  7 NM 1st segment: >0% 140 – 150 kts 0'30" 3'00" 2'30" 2'00"
Procedure Design Missed Approach Gradient JAR (a) The horizontal distance necessary to land and to come to a complete stop from a point 50 ft above the landing surface must be determined (for standard temperatures, at each weight, altitude and wind within the operational limits established by the applicant for the aeroplane) as follows: (1) The aeroplane must be in the landing configuration. 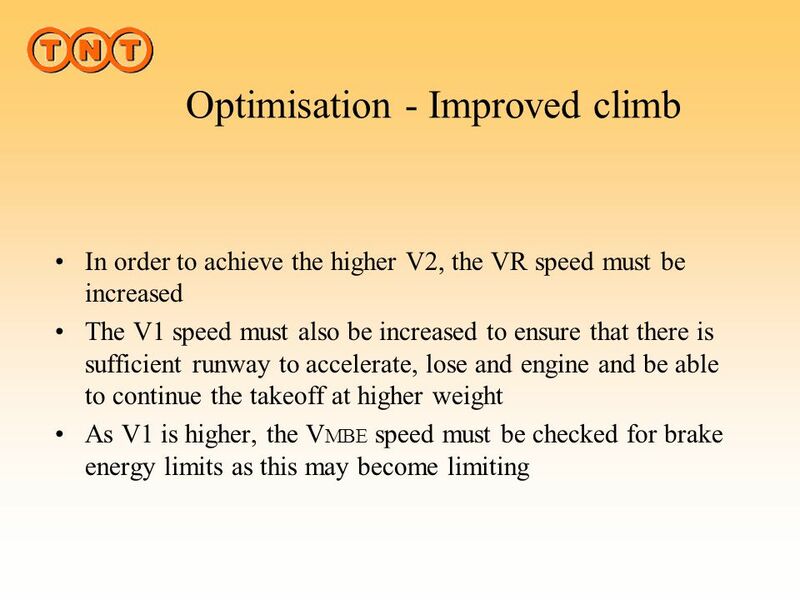 (2) A stabilised approach, with a calibrated airspeed of VREF must be maintained down to the 50 ft height. 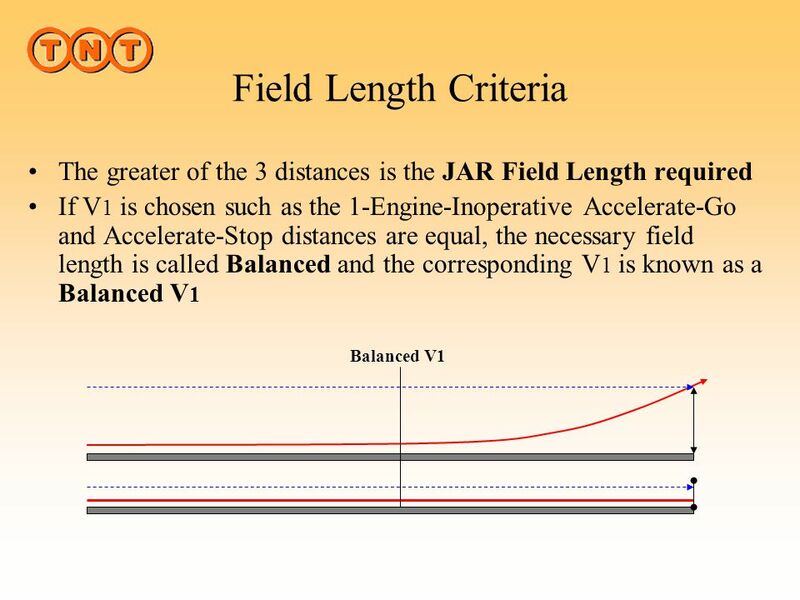 VREF may not be less than-- (i) 1·23 VSR0; (ii) VMCL established under JAR (f); and (iii) A speed that provides the manoeuvring capability specified in JAR (g). 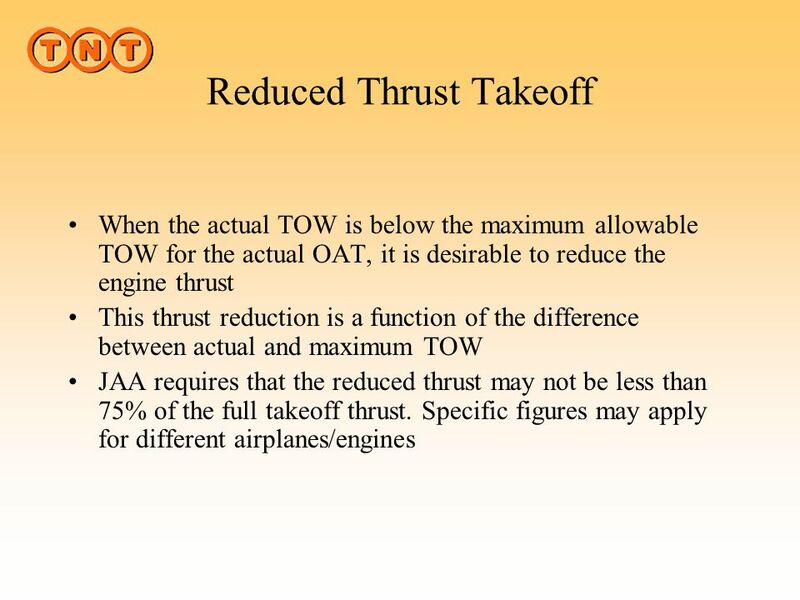 (3) Changes in configuration, power or thrust, and speed, must be made in accordance with the established procedures for service operation. 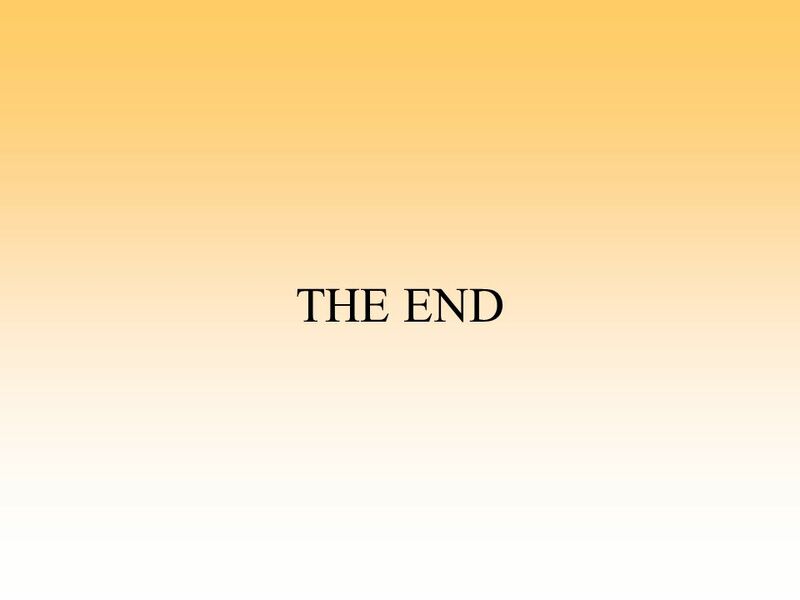 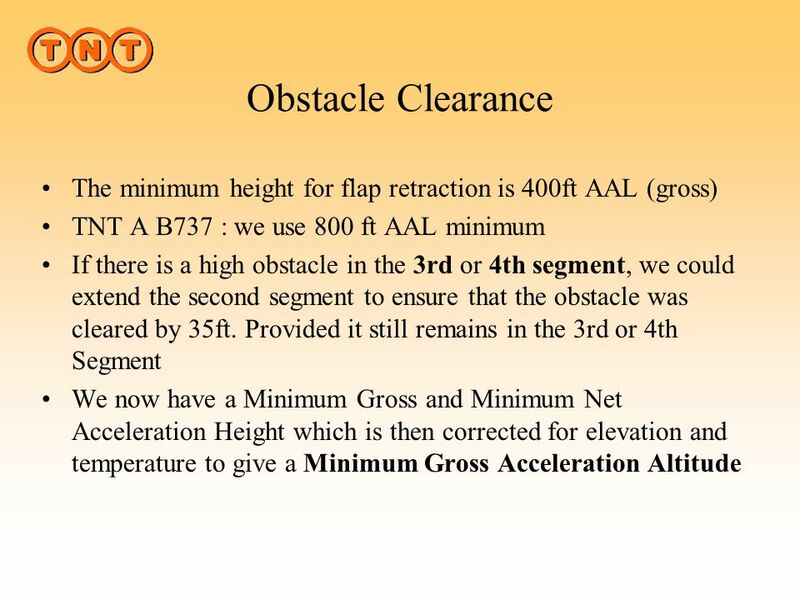 (See ACJ (a)(3).) 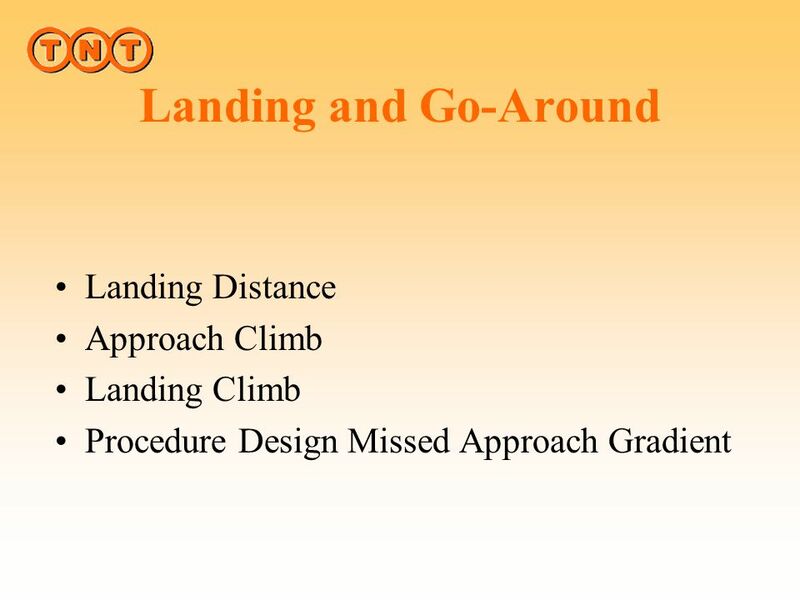 (4) The landing must be made without excessive vertical acceleration, tendency to bounce, nose over or ground loop. 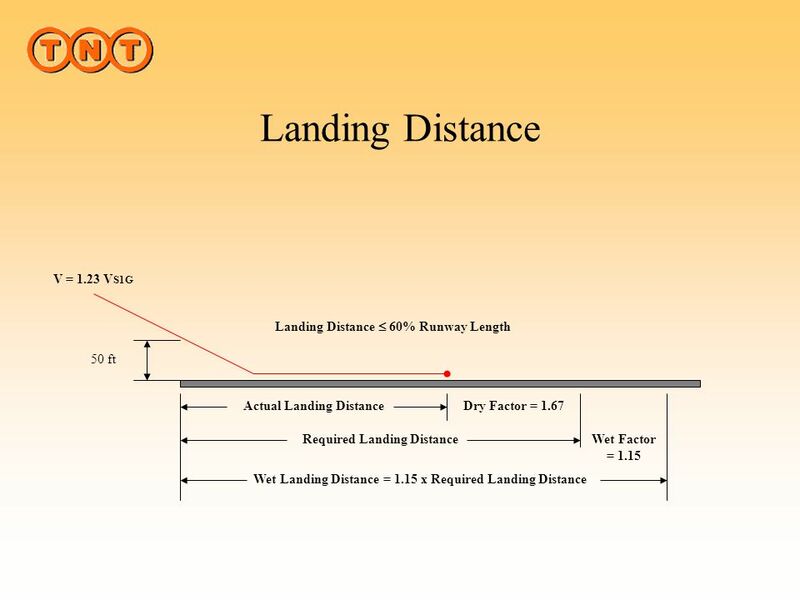 (5) The landings may not require exceptional piloting skill or alertness. 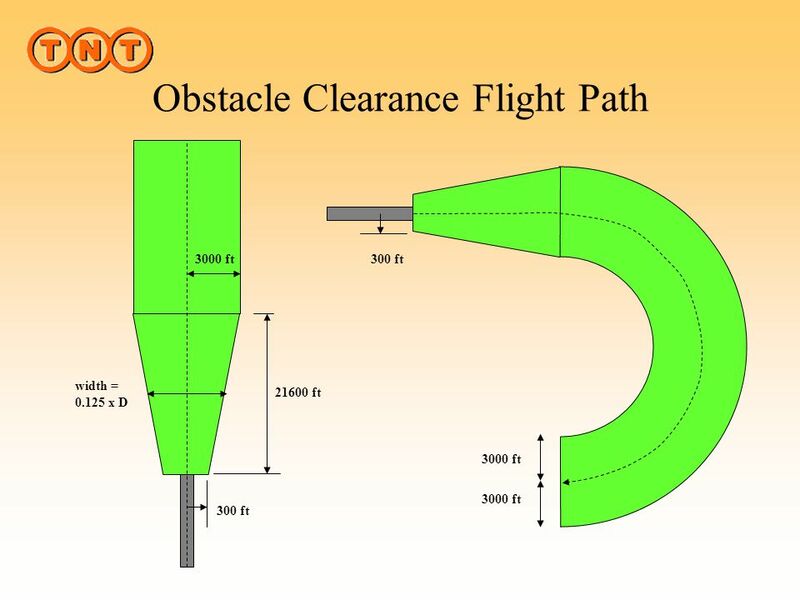 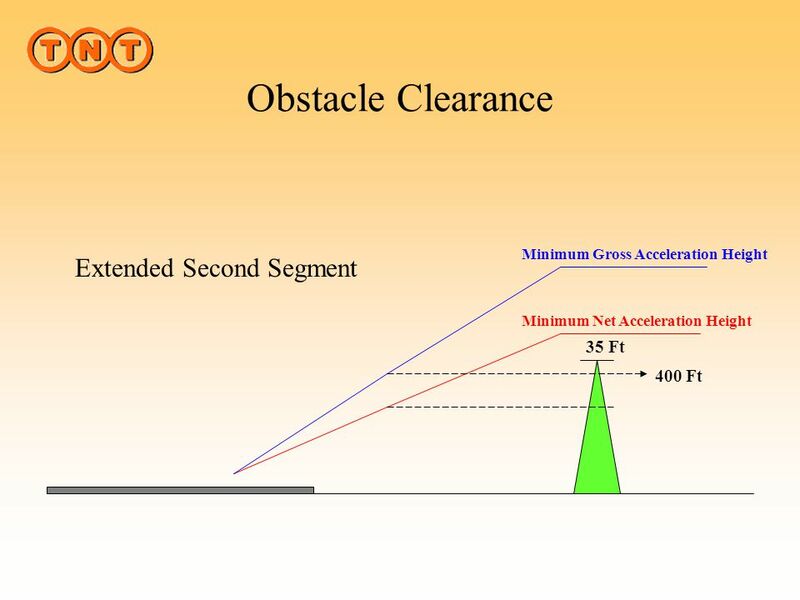 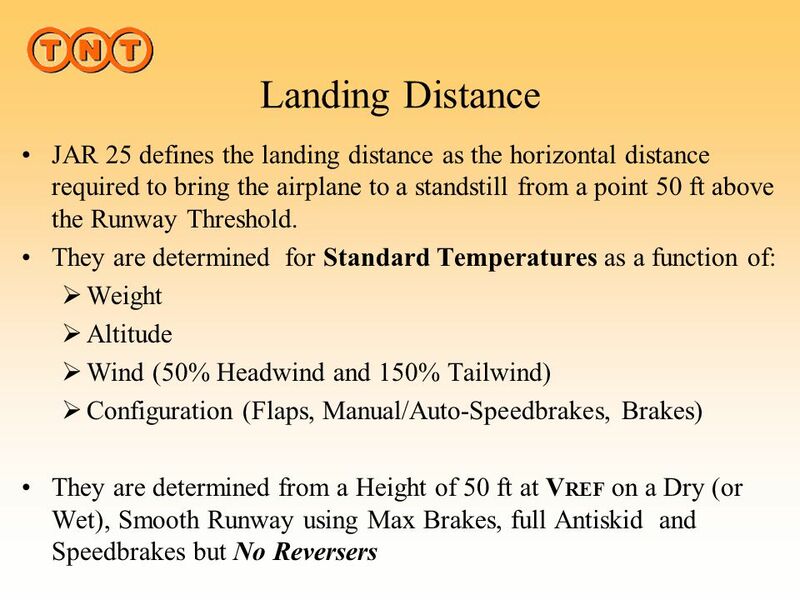 (b) The landing distance must be determined on a level, smooth, dry, hard-surfaced runway. 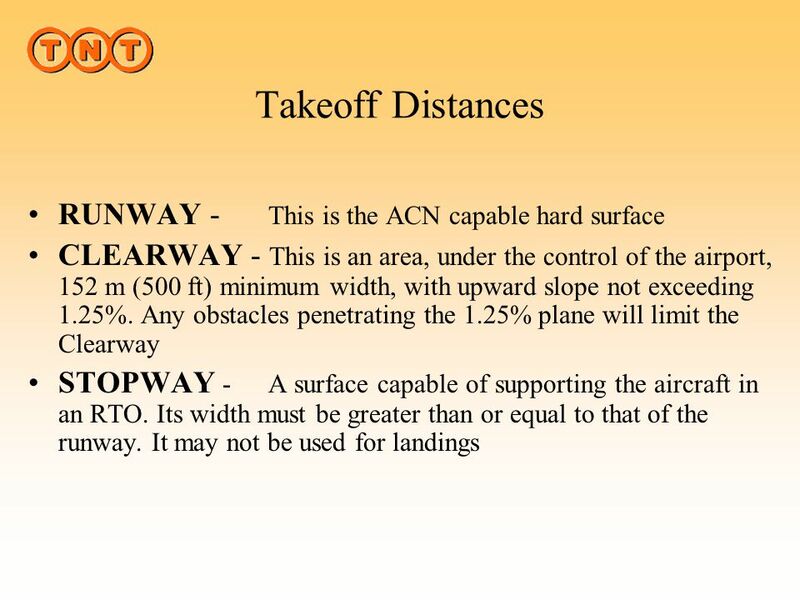 (See ACJ (b).) 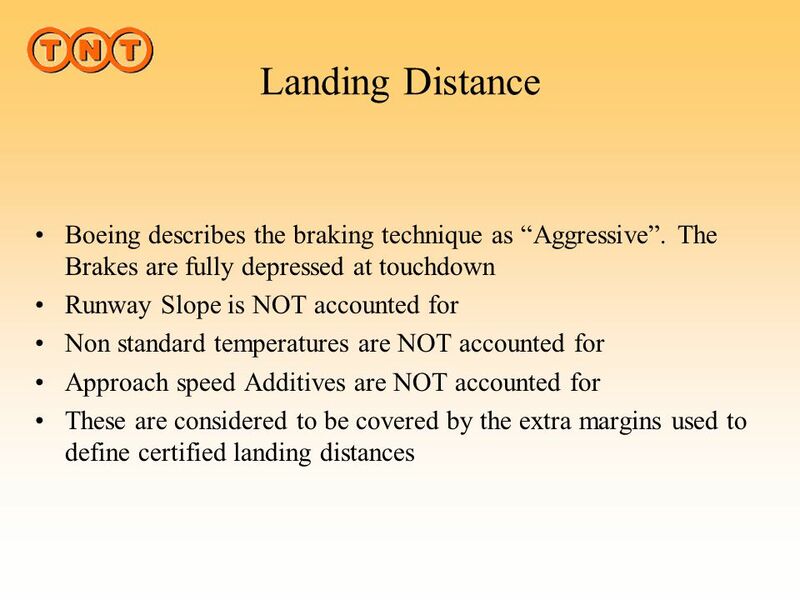 In addition-- (1) The pressures on the wheel braking systems may not exceed those specified by the brake manufacturer; (2) The brakes may not be used so as to cause excessive wear of brakes or tyres (see ACJ (b)(2)); and (3) Means other than wheel brakes may be used if that means-- (i) Is safe and reliable; (ii) Is used so that consistent results can be expected in service; and (iii) Is such that exceptional skill is not required to control the aeroplane. 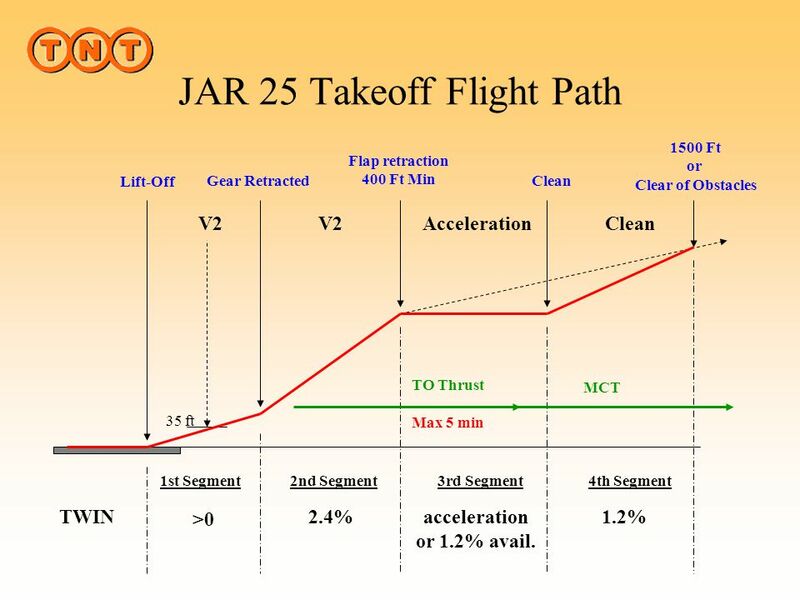 (c) Not required for JAR-25. 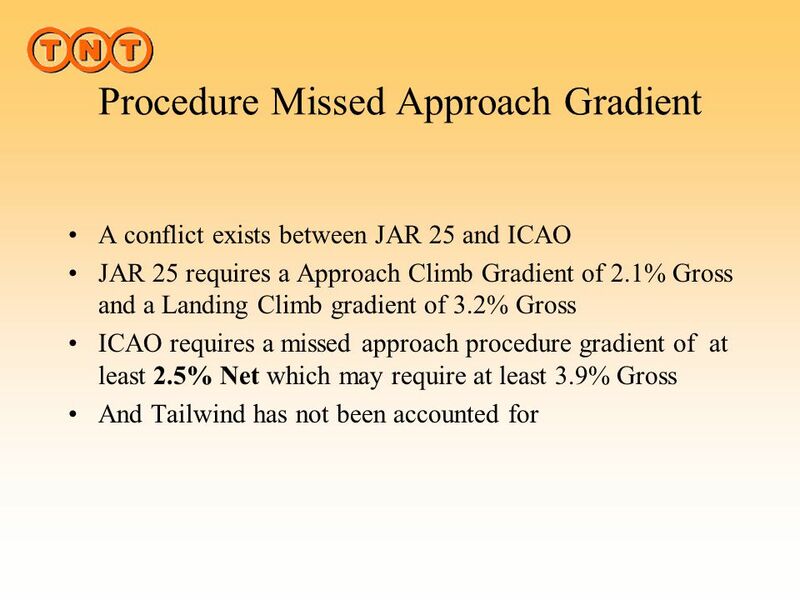 (d) Not required for JAR-25. 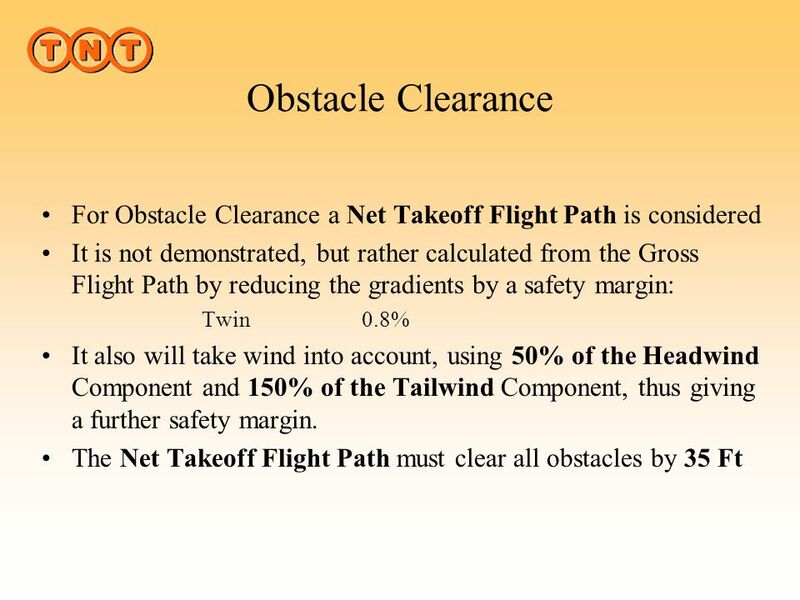 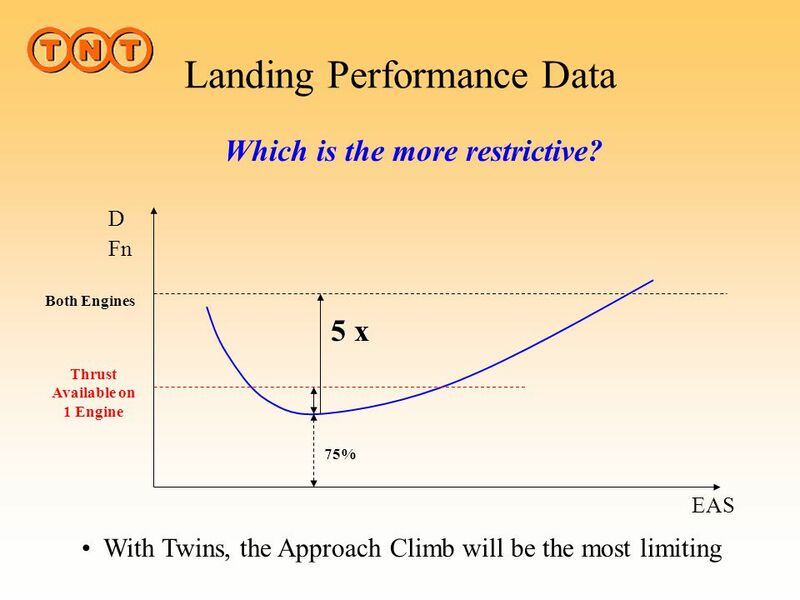 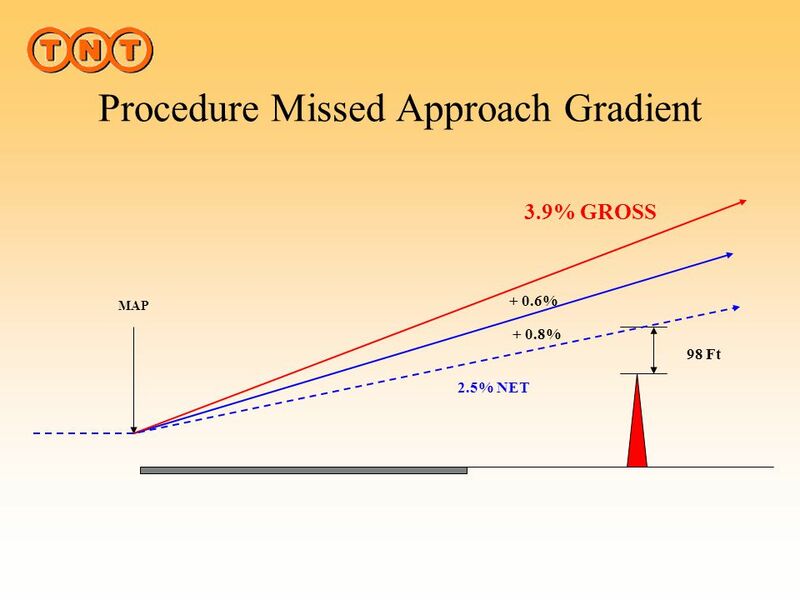 (e) The landing distance data must include correction factors for not more than 50% of the nominal wind components along the landing path opposite to the direction of landing, and not less than 150% of the nominal wind components long the landing path in the direction of landing. 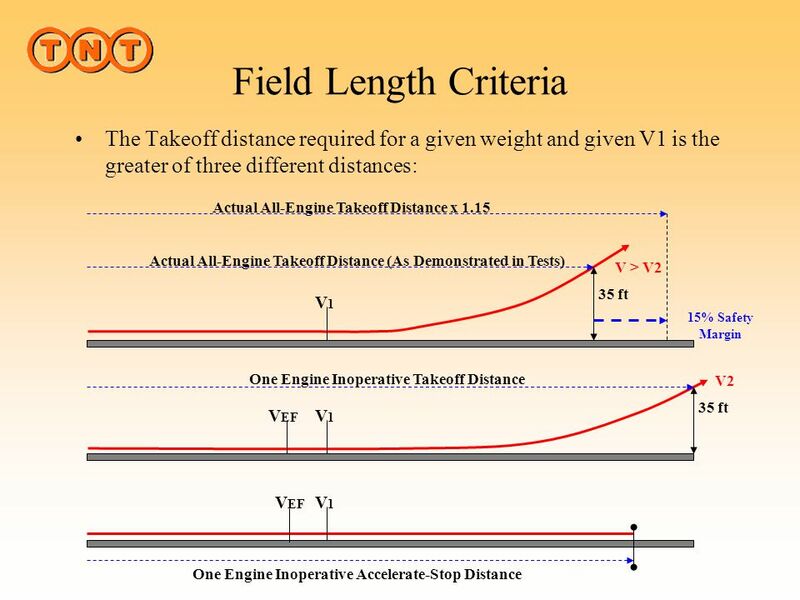 (f) If any device is used that depends on the operation of any engine, and if the landing distance would be noticeably increased when a landing is made with that engine inoperative, the landing distance must be determined with that engine inoperative unless the use of compensating means will result in a landing distance not more than that with each engine operating. 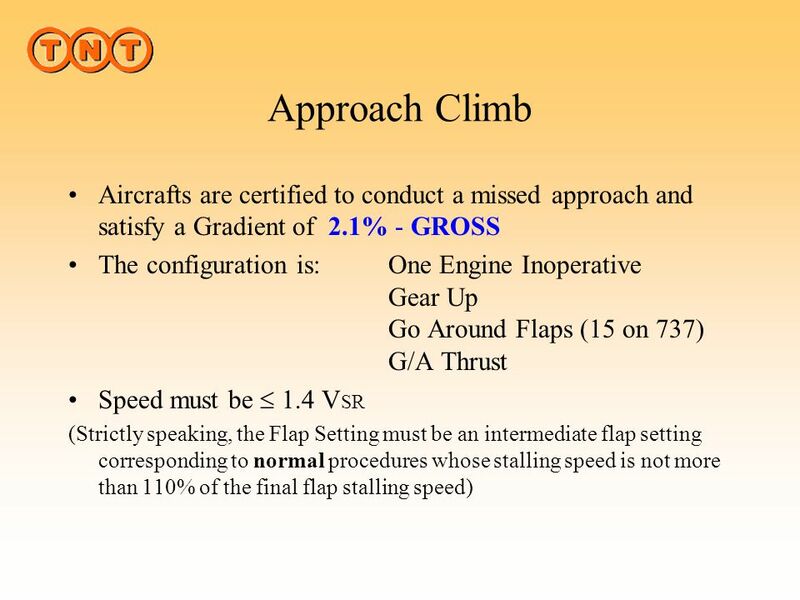 48 Approach Climb Aircrafts are certified to conduct a missed approach and satisfy a Gradient of 2.1% - GROSS The configuration is:	One Engine Inoperative	Gear Up Go Around Flaps (15 on 737)	G/A Thrust Speed must be  1.4 VSR (Strictly speaking, the Flap Setting must be an intermediate flap setting corresponding to normal procedures whose stalling speed is not more than 110% of the final flap stalling speed) JAR (d) Approach. 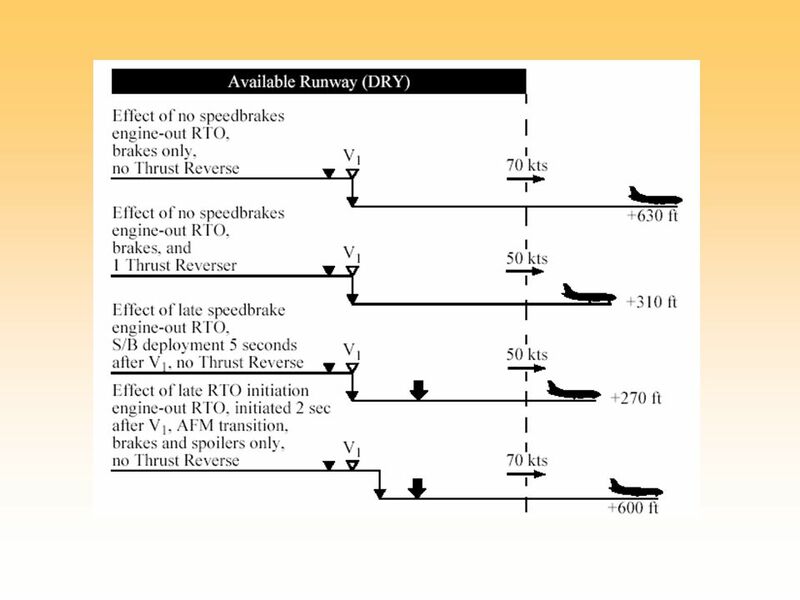 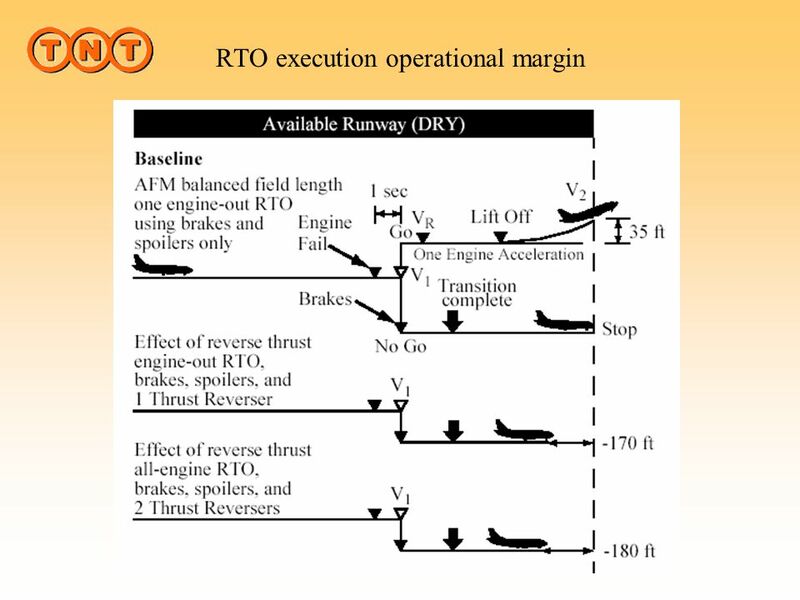 In a configuration corresponding to the normal all-engines-operating procedure in which VSR for this configuration does not exceed 110% of the VSR for the related all-engines-operating landing configuration, the steady gradient of climb may not be less than 2·1 % for two-engined aeroplanes, 2·4% for three-engined aeroplanes and 2·7% for four-engined aeroplanes, with-- (1) The critical engine inoperative, the remaining engines at the go-around power or thrust setting; (2) The maximum landing weight; (3) A climb speed established in connection with normal landing procedures, but not more than 1·4 VSR; and (4) Landing gear retracted. 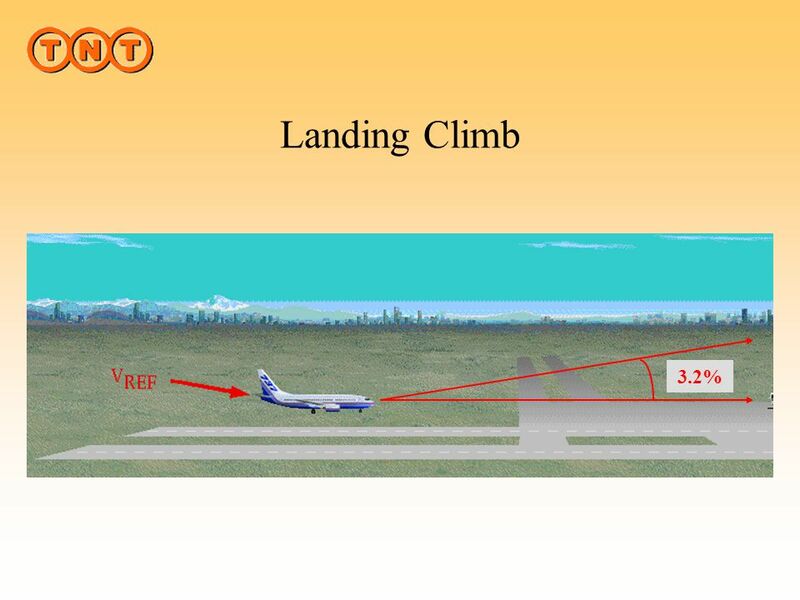 50 Landing Climb Aircrafts are certified to conduct a missed approach and satisfy a Gradient of 3.2% - GROSS The configuration is:	All Engines Operating	Gear Down Landing Flaps (30 or 40 on 737)	G/A Thrust The speed must be  1.13 VSR and VMCL It is also a requirement that full G/A thrust must be available within 8 seconds of the thrust levers forward from idle JAR Landing climb: all engines operating In the landing configuration, the steady gradient of climb may not be less than 3·2%, with-- (a) The engines at the power or thrust that is available 8 seconds after initiation of movement of the power or thrust controls from the minimum [flight idle to the go-around power or thrust] setting (see ACJ (a)); and (b) A climb speed which is-- (1) Not less than-- (i) 1·08 VSR for aeroplanes with four engines on which the application of power results in a significant reduction in stall speed; or (ii) 1·13 VSR for all other aeroplanes; (2) Not less than VMCL ; and (3) Not greater than VREF. 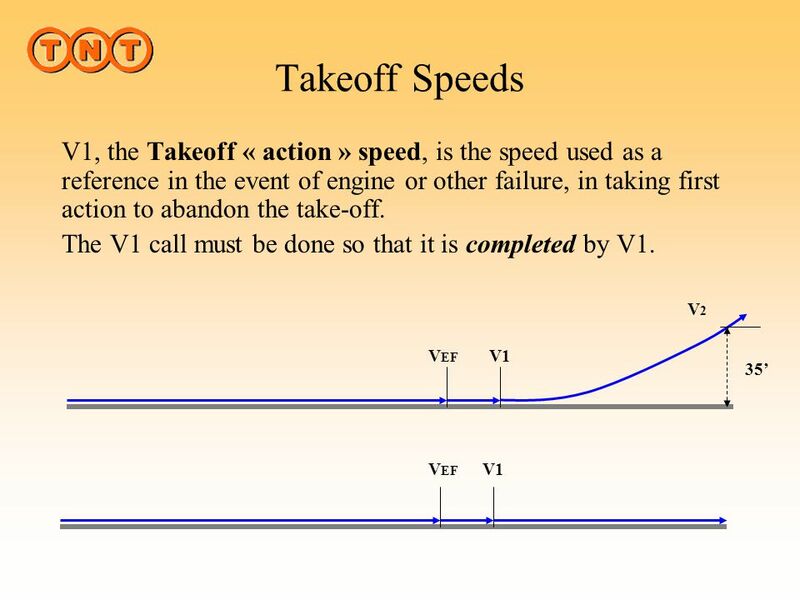 VMCL, the minimum control speed during approach and landing with all engines operating, is the calibrated airspeed at which, when the critical engine is suddenly made inoperative, it is possible to maintain control of the aeroplane with that engine still inoperative, and maintain straight flight with an angle of bank of not more than 5°. 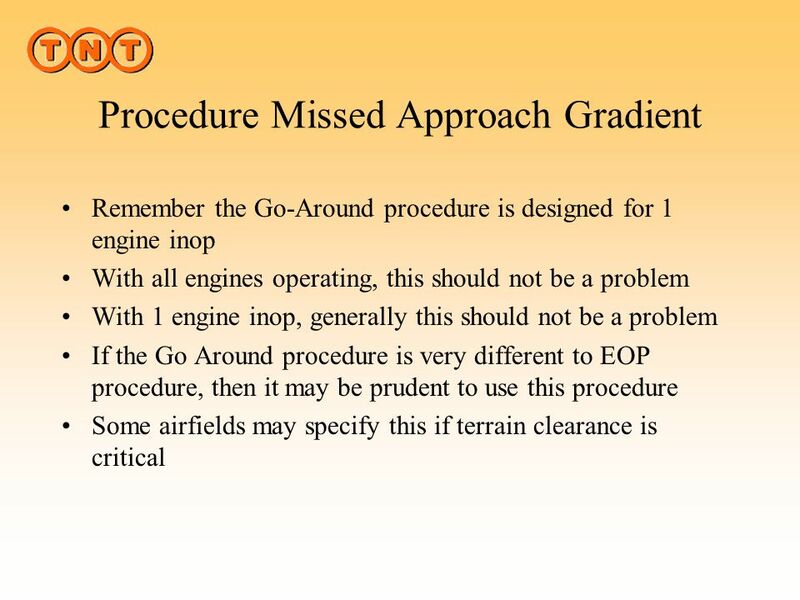 …but what if you lose one on the go-around from a normal approach ?... 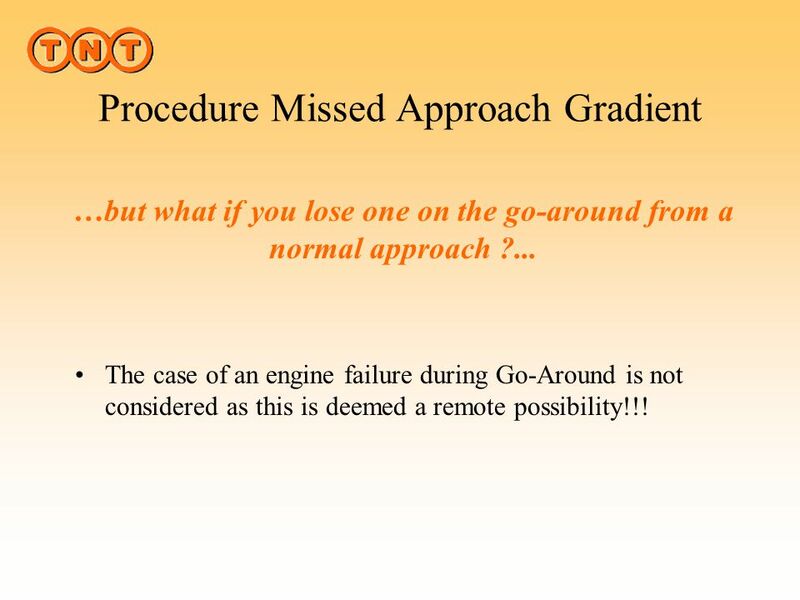 The case of an engine failure during Go-Around is not considered as this is deemed a remote possibility!!! 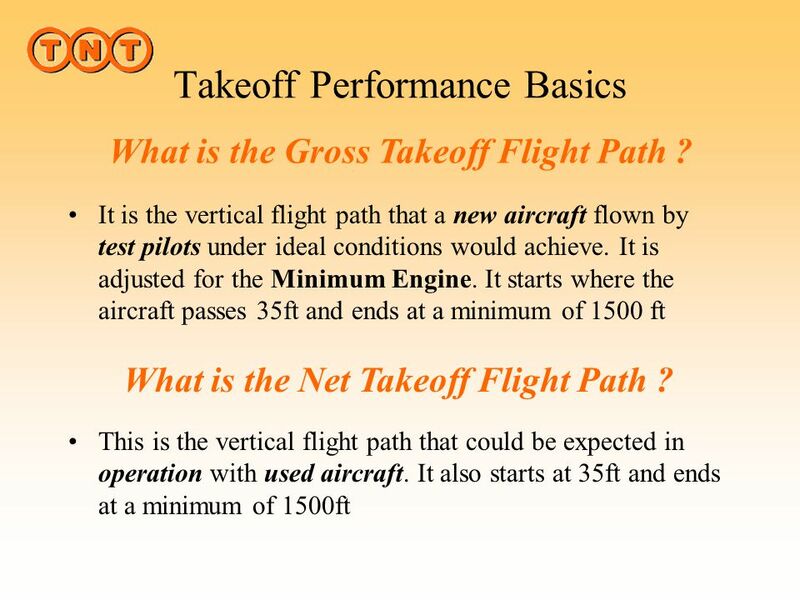 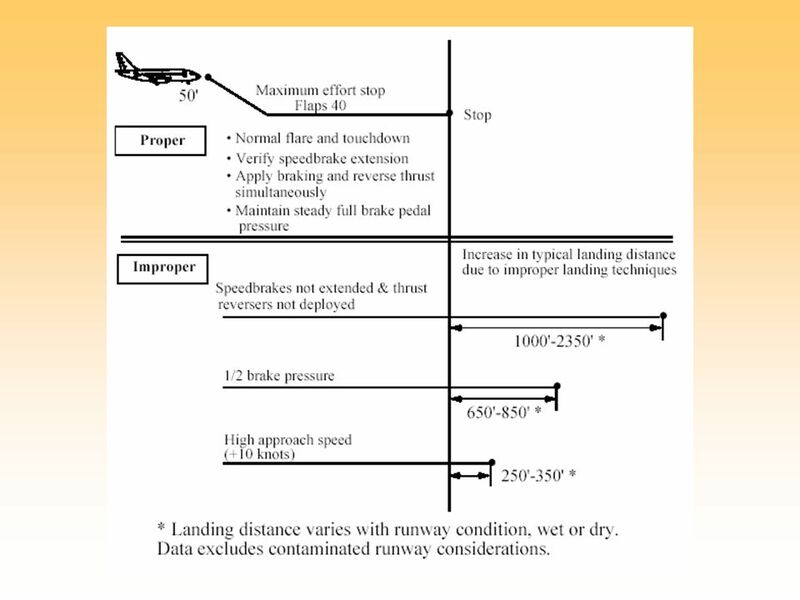 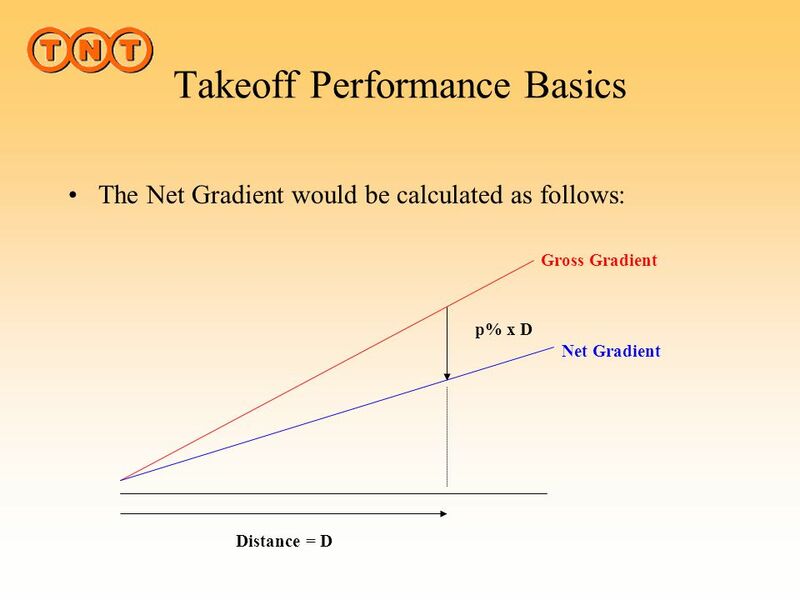 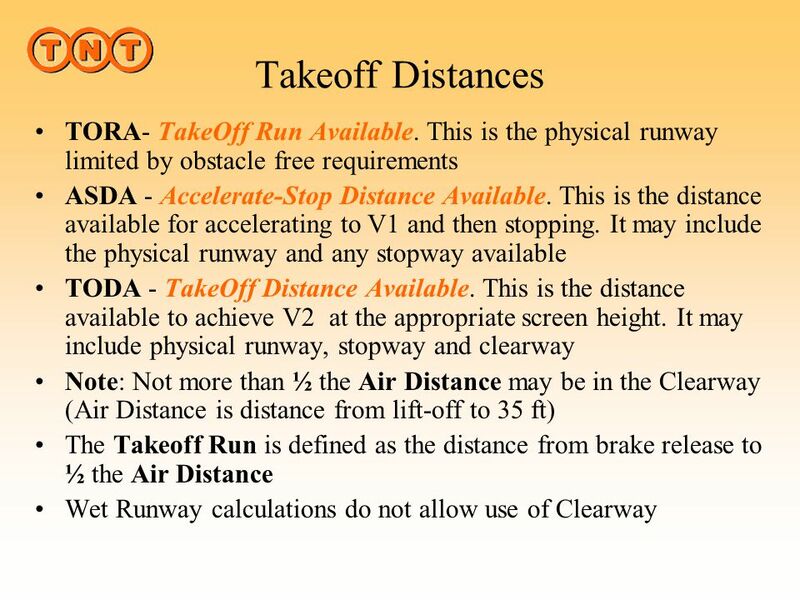 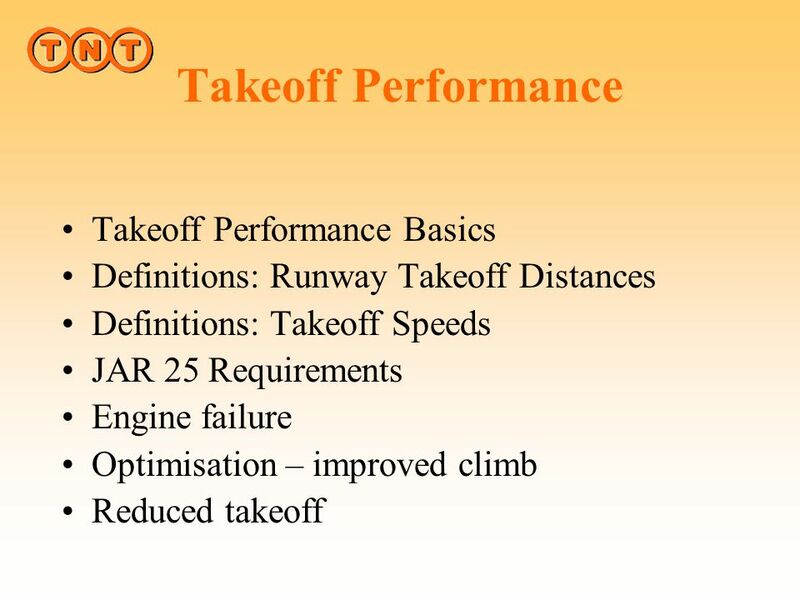 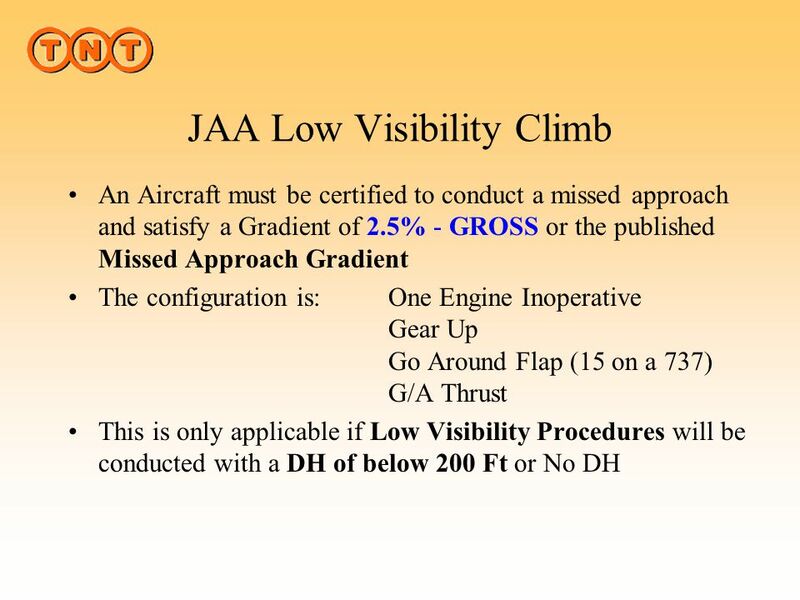 Download ppt "B737 Performance Takeoff & Landing"
AIRCRAFT HANDLING Part 6 General Flying. 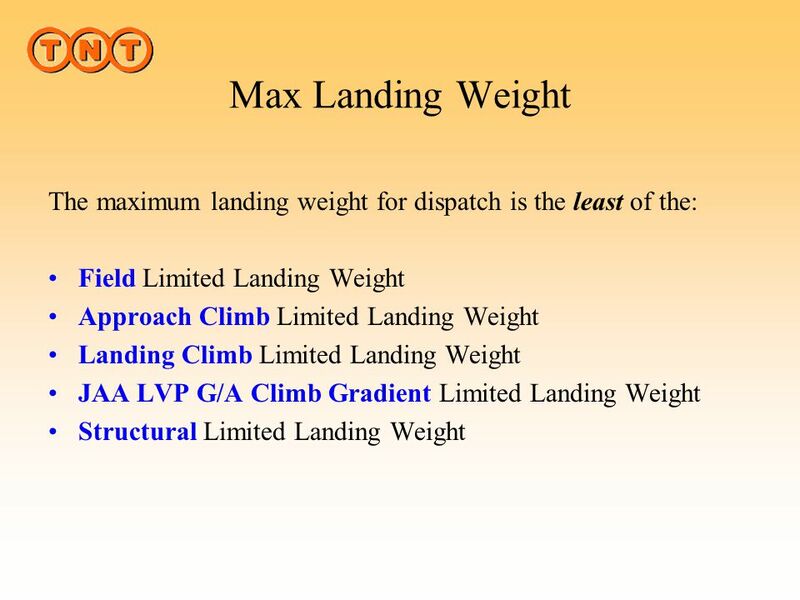 General Flying. 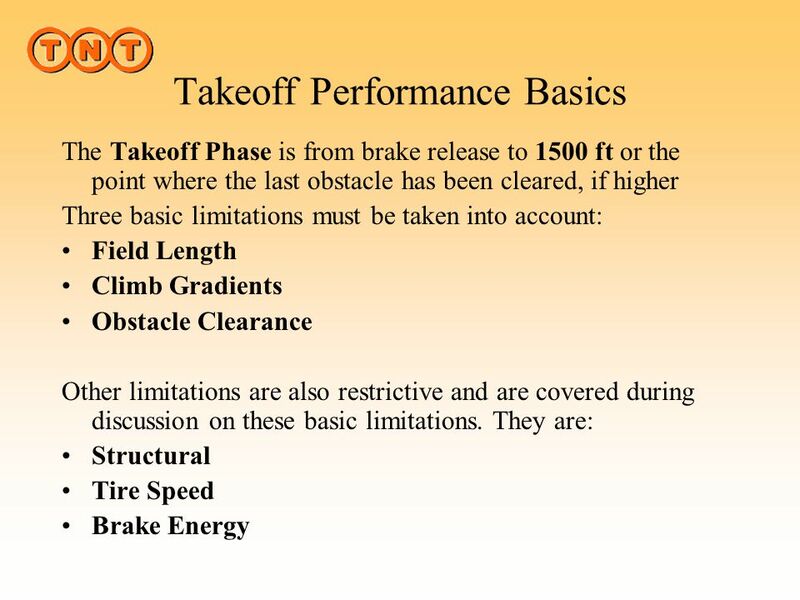 Recap Aircraft Maintenance Ground Handling Prep for Flight General Flying. 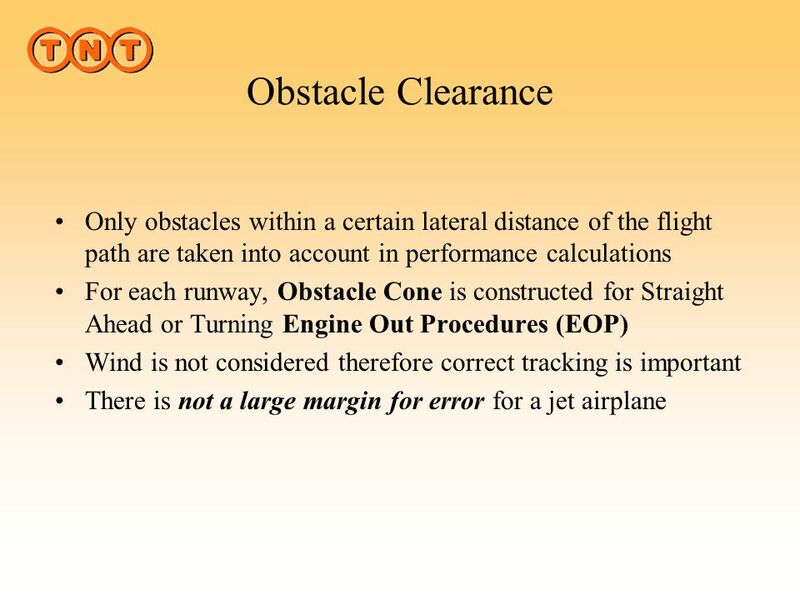 OPSG 1 JAR OPS Noise Abatement Procedures Capt. 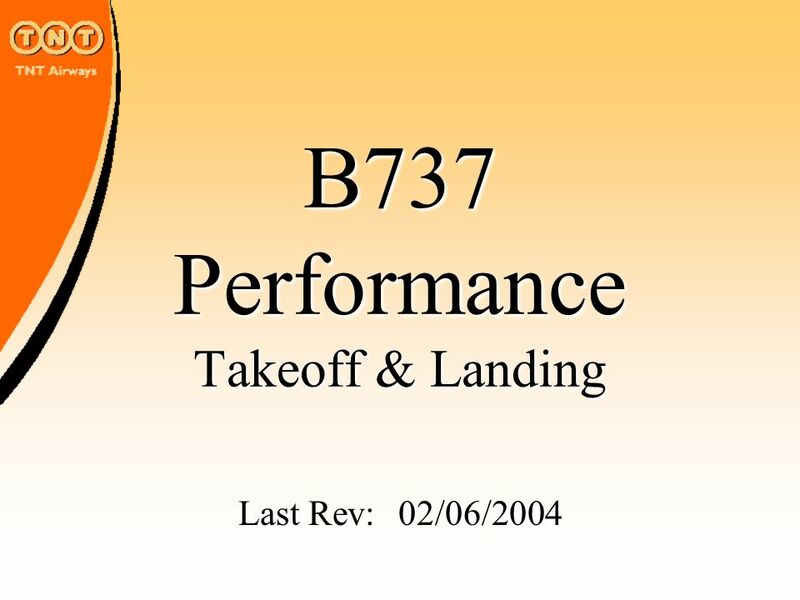 Claude Godel OST 05-4. 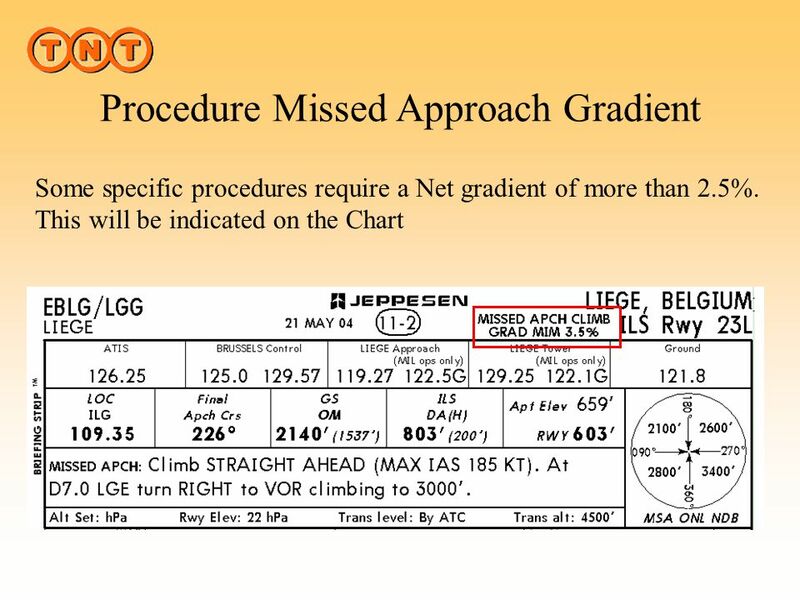 #4918. 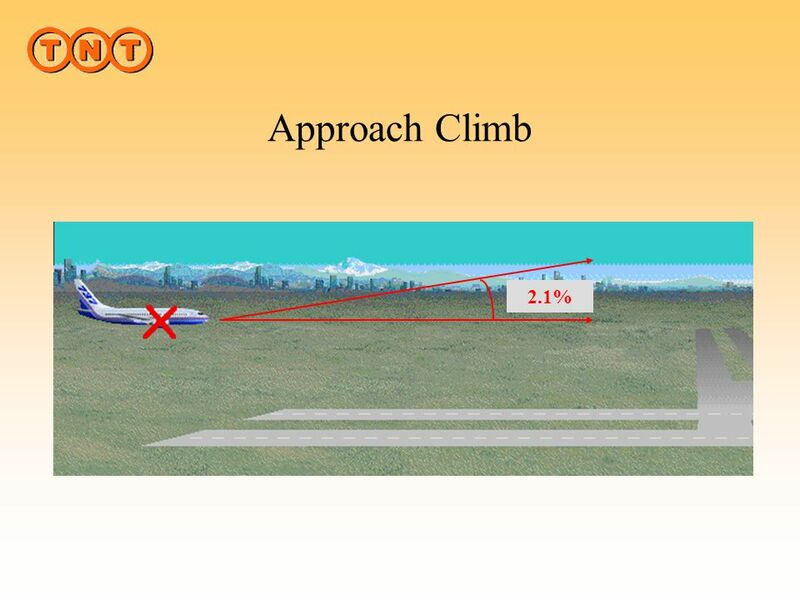 When an airplane is accelerated, some attitude indicators will precess and incorrectly indicate a A- climb. 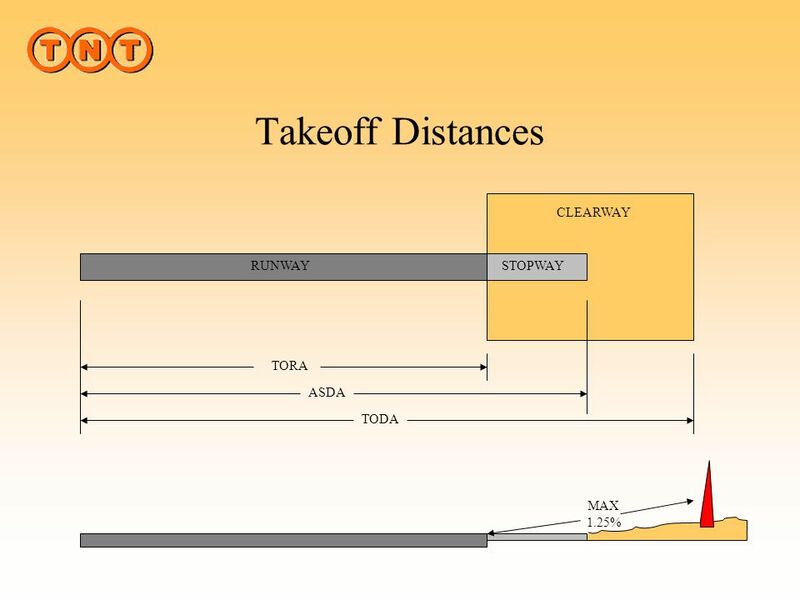 B- descent. 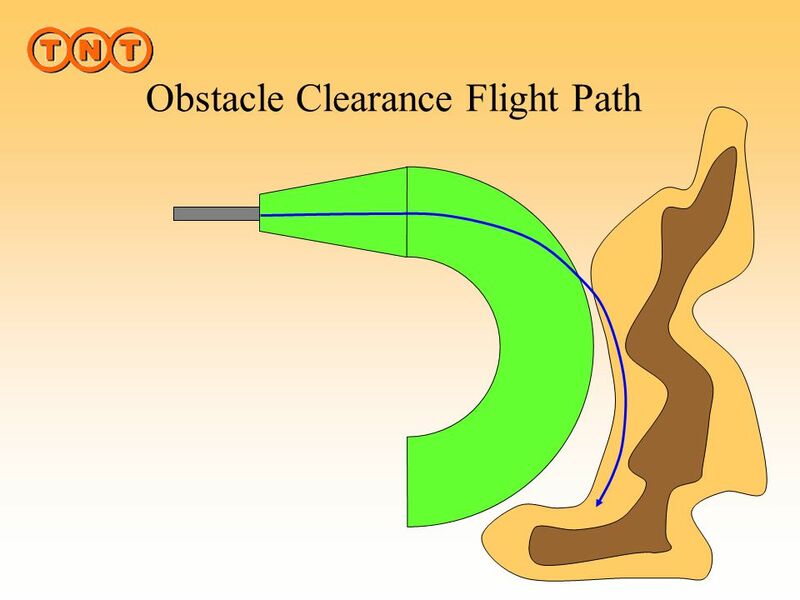 C- right turn.